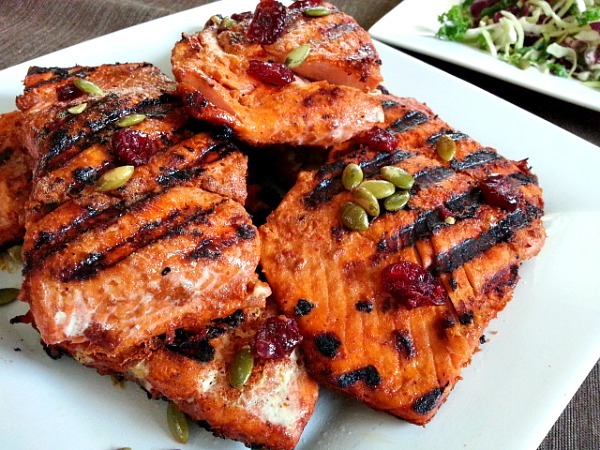 I wish I had a history to share about this very delicious grilled salmon recipe but unfortunately I don’t, since Salmon is not found in the Indian Oceans but only in North Atlantic and Pacific Ocean. The best part though, it uses Goan spices ;-). 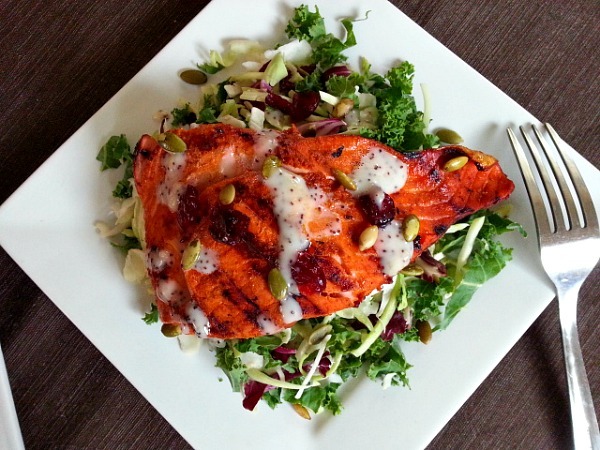 When my husband first grilled salmon fillets with the recheado masala we really enjoyed it with a salad so much that is became a monthly staple in our home. Grilling salmon more than pan-frying is a much healthier way to enjoy the fish and it’s rich omega-3 fatty acids keeps me smart and witty ;-). 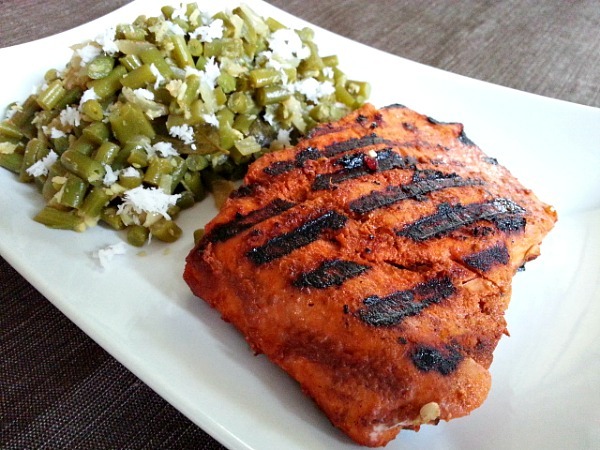 What I really love about this recipe is that even though it is marinated in spice paste it is full of bold flavors without too much heat as the added ketchup balances it. Also works well for those who prep and plan their meals as you can freeze the marinated salmon for couple weeks and use it when you need something quick and healthy. Do note that as an Indian we usually eat out meats and fishes well done so my cooking time may be longer then what you usually are used to. So please adjust your cooking time to your preference. Wash the fish and towel dry it. In a mixing bowl mix the recheado paste, ketchup and salt. 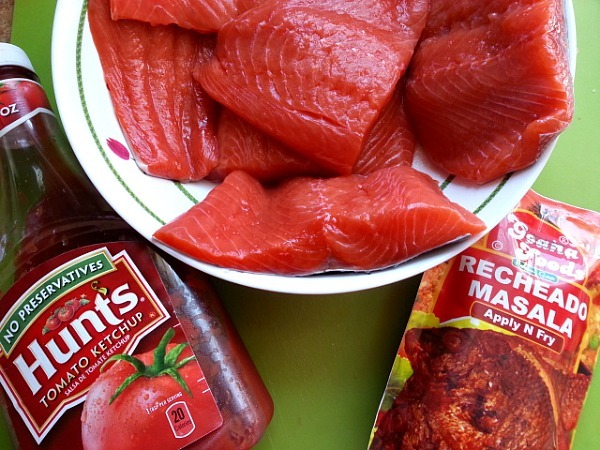 Apply it to the fish and marinade for at-least 20-30 minutes or overnight. Heat the grill (I use an electric grill) spray with cooking oil and grill the salmon fillet for 7-10 minutes on each side. Serve with a side of Pulao Rice, Green beans or with a refreshing Sweet Kale Salad found in Costco. Du bon saumon accompagnée d’une bonne salade! Very good meat! Just swinging by to tell you I nominated you on the one lovely blog award! Keep writing!! What a beautiful dish – looks so healthy and tasty! Just looking at a Big Green Egg at the moment it would be good cooked in that. Yum. I saw farmed salmon in Nepal – beautiful from the glacial rivers of the Himalayas – but didn’t get to eat any. This is mouth watering. My vegetarian self has salmon once every couple of weeks at home in Australia. 😇 I do it dry pan fried no oil just a tiny spray and just cooked. With a rocket and boiled potato salad and a French seeded mustard, EVOO, lime juice and cracked pepper vinaigrette. Iove your cooking and blogging. The last image is wonderful! It’s composed so well, and the lighting is great. I want to order the dish and try it! WELL DONE!